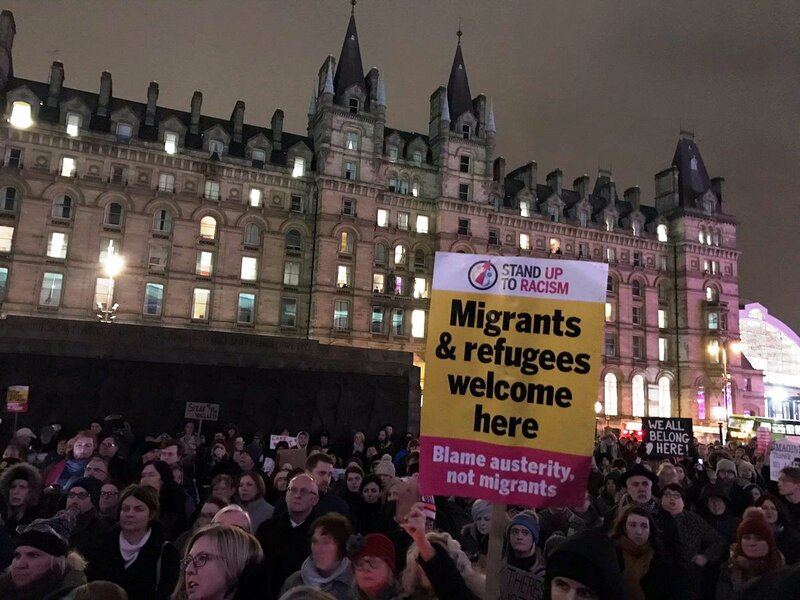 Angry protesters gathered at St George’s Plateau tonight to demonstrate against President Donald Trump’s controversial banning of people from seven Muslim-majority countries from entering the US. 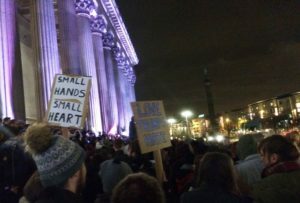 The executive order, which has targeted people from Iraq, Iran, Libya, Somalia, Sudan, Syria and Yemen, provoked similar rallies across the UK. In Liverpool, this was the second protest in the city against Trump since his tenure as US President began 11 days ago. Despite the demonstration being organised at short notice – in less than 24 hours – a large crowd of hundreds turned up to voice concerns and shout chants for more than 90 minutes against the new Trump regime and his early measures. Kevin Buirna, from political activist group Momentum, told JMU Journalism: “It is a good turnout. We have a lot of demonstrations and this is looks very big so far, so in that respect it’s very pleasing but not surprising because Donald Trump’s presidency and his order to ban people from Muslim-majority countries is something a lot of people feel strongly about. The demonstration featured a number of speakers and one of them, Steven Fletcher, told the assembled crowd: “Unless people stand united, unless people stand together, unless people disagree with something they believe to be wrong – wherever that may be – things will never change. “Liverpool is well placed to stand united with the rest of the UK and America as an example of how solidarity, in the face of real injustice, can make a big change.